Jun 23, 2015 • The European Space Agency’s Sentinel-2A successfully launched into orbit last night from Europe’s Spaceport in Kourou, French Guiana aboard a Vega rocket (10:52 p.m. local time; 01:52 GMT). 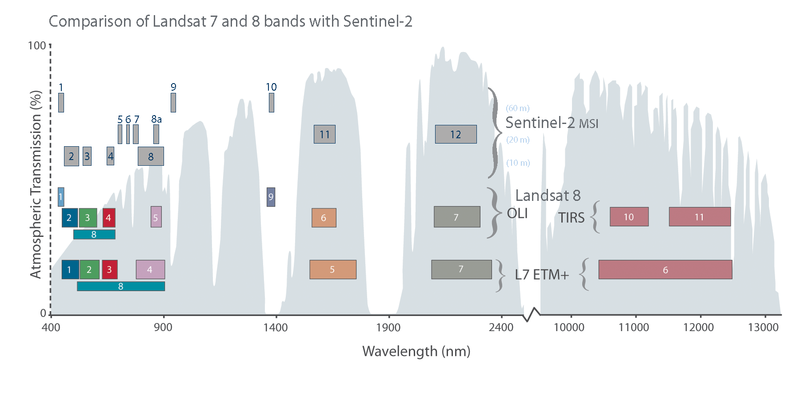 The Sentinel-2A satellite has spectral bands similar to Landsat 8’s (excluding the thermal bands of Landsat 8’s Thermal Infrared Sensor). The placement of the Sentinel-2A bands, as compared to Landsat 8 and Landsat 7 bands, can be seen in the graphic above. The main visible and near-infrared Sentinel-2A bands have a spatial resolution of 10 meters, while its “red-edge” (red and near-infrared bands)—specifically designed to monitor vegetation—along with its two shortwave infrared bands have a 20-meter spatial resolution, and its coastal/aerosol, water vapor, and cirrus bands have a 60-meter spatial resolution. During the development of Landsat 8 and Sentinel-2A, calibration scientists from both projects worked together to cross-calibrate the sensors. Many scientists and researchers are looking forward to collectively using data from Landsat 8 and Sentinel-2A. Sentinel-2A alone provides 10-day repeat coverage of Earth’s land areas. In combination with the 8-day coverage from Landsat 7 and 8 combined, users can look forward to better-than-weekly coverage at moderate resolution. Repeat coverage capabilities will further increase with the planned launch of a second Sentinel-2 satellite (Sentinel-2B) next year. After the successful Sentinel-2A launch, Dr. Garik Gutman, the NASA Land Use / Land Cover Change program manager, said, “We are looking forward to new exciting data to complement Landsat observations and to collaborative research—especially because ESA followed USGS in its open data policy.” This sentiment is echoed by many in the Landsat community. This entry is filed under Data, Feature-FrontPage, News.